Tomorrow it's 2016! I love a new year. What a reminder that there's always a fresh start, hope, and promise. One of my resolutions is always to read more, so I thought I'd share my favourite books from this past year (brief descriptions below!) 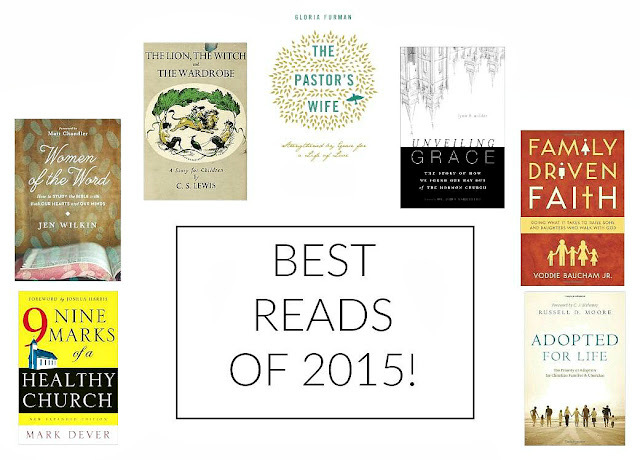 You might want to add them to your reading list for 2016! This year for Christmas I got a Kobo and I'm so excited about it! I'll be posting about my reading list for 2016 in a few days. Now that I'll be reading more library books (Kobo eReaders let you borrow ebooks from your local library...from bed! Glorious! ), it will be pretty long I think. But there's still something about a good ol' paperback, isn't there? I think I'll use my Kobo for fiction primarily, and stick with paper when it comes to theology, ministry, marriage and parenting books - because those are the books I want to re-read again and again, and share with friends. The Pastor's Wife by Gloria Furman - Such a refreshing encouragement to pastor's wives. So rooted in the Gospel, full of grace, and intentionally not a how-to. Women of the Word by Jen Wilkin - I bought 30 copies of this and gave it to all the young women in our church! A must read for women who want to grow in their knowledge of the Bible, their understanding of how to study and read God's Word, and their motivation to do so. Unveiling Grace by Lynn Wilder - Probably my favourite book from 2015. A beautifully written biography of one devout Mormon family's journey to Biblical Christianity. Most Christians don't know what to do with Mormons and usually avoid the name-tag-clad duos who come calling (Me! Guilty! ), and this book is for you! Family Driven Faith by Voddie Baucham - I recommend this book with a huge asterisk. Some of the chapters in this book were among the most encouraging and inspiring I've ever read on the subject of shepherding our Children to know and love Jesus. But other chapters I found too one-sided (for home schooling, especially). But I loved the former chapters so much that I still recommend it constantly. The Fruitful Wife by Hayley DiMarco - Each chapter is so unique in this book. I find myself recommending separate chapters to people depending on where they're at, rather than the whole book, simply because it's SO varied and has so much wisdom and truth, all over the map. Grace-filled and a light, encouraging read. Chapter one on love made me cry and I've read it three times! The Lion, The Witch, and The Wardrobe by C.S.Lewis - I read this classic for the first time at Easter this year and it was perfect. I can't wait to read it with the kids when they're older! 9 Marks of a Healthy Church by Mark Dever - This book is a must-read for Pastors and their wives. This is a post for another day, but I definitely think pastor's wives need to study these matters alongside their husbands, and not just smile and nod while their husbands shepherd the flock. This book is so solid and has been formative to our church's beginning. I re-read it this year, but first read it in 2011. Adopted for Life by Russell Moore - I read this book first in 2011, again in 2013, and again this year. I still wonder if adoption is in our future, and love re-reading and recommending this great book. Happy reading! I'll post my 2016 reading list soon! ps - Brad is loving this book right now. We definitely have slightly different taste, no?